A European spacecraft destined to visit a comet later this year will get the ultimate wake-up call Monday (Jan. 20) and you can watch it live online. 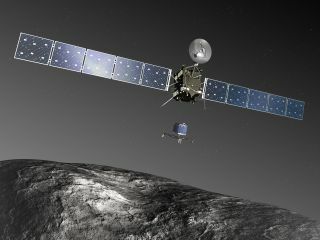 After more than two years in a deep sleep, the European Space Agency's Rosetta spacecraft is due to awake from its "hibernation" mode at 5 a.m. EST (1000 GMT) on Monday to gear up for an August arrival at its comet target. To mark the occasion, ESA officials will celebrate with a special day-long series of press briefings from the European Space Operations Center in Darmstadt, Germany. The Rosetta spacecraft launched in 2004 on a decade-long journey to the Comet 67P/Churyumov-Gerasimenko. The spacecraft is slated to arrive in orbit around the comet in August of this year to begin studying its target and, ultimately, land the small Philae lander on the comet's surface. Rosetta flew by Earth three times, and Mars once, to build up enough speed to reach the comet. Along the way, it also visited two asteroids —Steins and Lutetia. But in mid-2011, Rosetta entered a 31-month "hibernation" as it sailed out toward the orbit of Jupiter — where the available sunlight was too low to power all of its systems. Only the probe's main computer and some heaters stayed on to keep it alive, ESA officials said. Rosetta's internal clock is programmed to wake the comet-chasing spacecraft on Monday to begin preparing for the August comet encounter. ESA officials have described it as "the most important alarm clock in the solar system." It will take Rosetta several hours after its 5 a.m. reactivation to warm its star trackers enough to orient itself to face Earth and beam its wake-up announcement to Earth. "Because of Rosetta's vast distance — just over 807 million kilometers (501 million miles) from Earth — it will take 45 minutes for the signal to reach the ground stations," ESA officials wrote in a statement. "The first opportunity for receiving a signal on Earth is expected between 17:30 GMT and 18:30 GMT (12:30 to 1:30 p.m. EST)." ESA's deep-space listening station in New Norcia, Australia, will be awaiting that signal, as will NASA's Deep Space Network radio antennas in Canberra, Australia, and Goldstone, Calif. Once the first signal is received, it will be transmitted to ESA's Space Operations Center and announced publicly using the Rosetta mission's Twitter feed @ESA_Rosetta. Currently, Rosetta is nearly 5.6 million miles (9 million km) from Comet 67P/Churyumov-Gerasimenko, but the probe is expected to close that gap to about 1.2 million miles (2 million km) by May, when it is scheduled to fire its thrusters to place it on a trajectory to arrive at the comet in August. The Philae lander is expected to be released to land on the comet in November, according to ESA officials. Visit SPACE.com on Monday for coverage of the comet-chasing Rosetta spacecraft's cosmic wakeup call in deep space.